9 question(s) from the community have been answered. Q how do you clean the shades? A The natural paper shades should only be cleaned with a dry clean. Use a duster or dry cloth. Q Does the shade come in an all brilliant white instead of the off-white natural? A The Visual Comfort Studio Sandy Chapman Square Tube Hanging Shade SL5820PN-NP only comes with the Natural Paper shade. There are no other shade options for this fixture. Q This fixture comes with a paper shade. Can it be ordered with a white linen shade instead? Q Do you ship to Sydney, Australia? 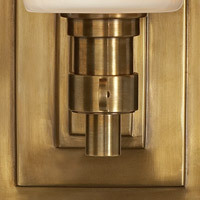 A All products purchased from Lighting New York are available to ship internationally. Please contact one of our lighting experts at 866.344.3875 Option 1 for more information. Q Can more chain be purchased? I have a 10' ceiling. 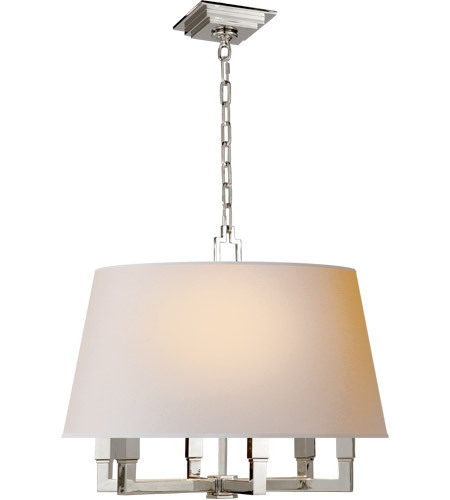 A The Visual Comfort E.F. Chapman Square Tube 6 Light Hanging Shade SL5820PN-NP is supplied with 6ft of chain and you can order additional chain. Q how can I order a replacement shade? A Glass and parts are available for most Visual Comfort products by contacting one of our customer service specialists at 866.344.3875 Option 3. Q Does this come in a smaller width? A The Visual Comfort E.F. Chapman Square Tube 6 Light Hanging Shade SL5820PN-NP is not available in any other size or width. Q How much does this fixture weigh? A The Visual Comfort E.F. Chapman Square Tube 6 Light Hanging Shade SL5820PN-NP actual fixture weight is not available, but the shipping weight is 21 pounds, so the hanging weight will be a little less than that. Q What is the best way to clean the chain and other polished nickel without smudging? A The Visual Comfort E. F. Chapman Square Tube Hanging Shade SL5820PN-NP can be cleaned with a soft dry cloth. No cleaning agents should be used.